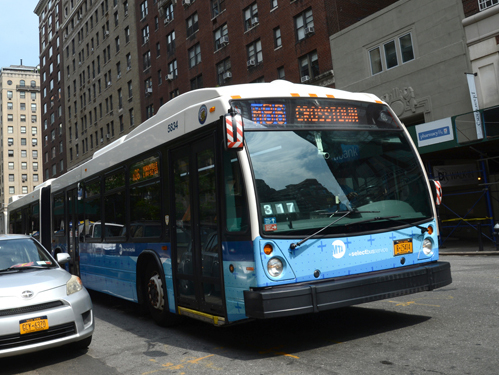 A new M86 Select Bus Service began this week between the Upper East Side and Upper West Side. According to DNAinfo, the MTA is looking to make the new service 15-20% faster than the regular M86 by simplifying routes, making stops further apart, and having passengers purchase their tickets in advance from a kiosk. There are eight MTA employees stationed at various stops to help explain the changes to riders and direct them to ticket kiosks and waiting areas. According to the MTA, the new buses also hold 100 people at a time, almost double the capacity of the current buses, and experience a 3-5 minute waiting time during rush hour. This is the eight bus route to receive Select Service, with Mayor de Blasio's goal being 20 routes citywide. Information on all of the city's Select Bus Service routes can be found on the MTA website.